I feel a very tactile connection with nature, tools, and raw materials. I feel that this is reflected in my work both as metalworker and painter. shapes, colors, textures, and objects found in nature. as well as the techniques and work of my peers. within the materials throughout my process. nature will always have command over the fundamental details. Liz Ann Lange graduated from Kohler High School in 1998, and served nearly 7 years as an aircraft structural maintainer in the United States Air Force. In 2006, she enrolled in the Bachelor of Arts program at Lakeland College where she earned her degree in Studio and Graphic arts. 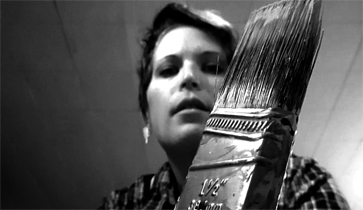 Liz dabbles in various media, and enjoys the diversions of metalwork, but her true passion lies in the materials and techniques of oil painting. The content of her work usually centers around representational portrayals of urban and suburban landscapes and the overlooked elements within. Liz is currently working on extending her series of nature-based abstract paintings out of her downtown Sheboygan, Wisconsin studio.